If you are a regular reader of this blog, you’ll know I’m all about finding systems and structures to make challenging things less challenging. Or, to put it more simply, I like to do things the easy way. To that end, I want to show you how to make a few tweaks to your average extended essay and earn top marks for it. The following are some advanced techniques that many International Baccalaureate (IB) extended essay supervisors might forget to share. And many aren’t aware of them. Before reading this blog post, I suggest reading my post on getting started with your extended essay. That article explains how to choose a good essay question, among other things. This article is about advanced techniques, the polish that can raise your grades (to a high B or an A). But if your foundation is off no amount of polishing is going to be enough. So again, make sure you get off to a good start. By now your Extended Essay contains the best sources that you could get your hands on. You’ve used them to analyze and draw conclusions. You’re satisfied with them. But you shouldn’t be. Even though you included the best information you could find (and you don’t want to look lazy) you should be the one (rather than your Extended Essay grader) to point out the weaknesses in your research. This defies common sense, but do it anyway. You might think this is rather like going to a job interview and pointing out why you’re a bad employee, but it’s not like that at all. Pointing out the weaknesses in your research shows that you know how to improve next time (which impresses us) and it shows that you’re taking an academic approach (you are able to be objective) rather than a self-conscious approach. Weaker students, students that haven’t put in my effort into their work, won’t want to do this because they know there are tons of weaknesses in their research. But if you’ve done a reasonable amount of work, using primary and secondary sources, it only helps you to be critical. To help you with this, there is a great checklist you can use called Test Before You Trust (link here) to help you ask important questions about your sources (i.e. Is the site free of advertising? Is the site one-sided or balanced). You can use the questions as prompts for your Extended Essay writing. For example, Question 14 asks, “Are sources given for statistics?” If you answer no, you can write in your Extended Essay something like, “Article X was written in an academic way and it was available on a site that was free of advertising and therefore perhaps less likely to be biased. However, the article did not provide the sources or raw data they used to calculate their statistics. So it is not possible to verify their accuracy.” See? Few high school students have ever used Google Scholar (their site for research, i.e. from university professors in your subject). Why? Because it can be boring. I’ll give you that. However, it is very, VERY impressive when high school students can read and understand and explain aspects of real academic articles. So try to find just one that relates to your Extended Essay, print it out, take a couple of hours with Dictionary.com, Wikipedia, and Google and try to figure out what the article’s talking about. And (intelligently) use a couple of quotes from it in your Extended Essay. It’s perhaps worth asking your parents or an older sibling to help you track down this article, because finding one that directly relates to your Extended Essay can be quite difficult (because you don’t yet know the meaning of all of the related key words). This might seem like a lot of work, but it sends a strong signal to your marker that you’re as serious as any university student. When you hear the word “proxy” you might think of VPN’s (Virtual Private Networks) that let you surf the web more freely. Proxy sources similarly allow you to research a bit more freely. Let’s say your Extended Essay is about the launch of a new organic lettuce in Singapore. You’ve looked around and there isn’t any data about lettuce in Singapore at all. In this case, an example of proxy research would be if you could find research on the sales of organic cucumbers. You can simply point out that no info on lettuce was available, and that you’ve made an assumption that the market for both items is similar. And then you can go on to make all kinds of insights into the market for lettuce, using the cucumber data. Proxies can be used (but rarely are actually used) in most Extended Essay’s. Even if you were able to find a lot of data, there is probably a way to use a proxy to strengthen your analysis. This one is self-explanatory. Just like on all of your exams, if you want to earn the top marks, you need to get into the head of the examiners. -What impresses them? -What are they actually giving marks for? -Is it possible you (and your supervisor) have overlooked (or misinterpreted) one of the criteria? -Could you tweak one of your sections (i.e. your conclusion) to make sure you’re going to get full marks for it? Talk to your friends and parents and teachers and your turtle about this. In reality, different examiners are going to have slightly different interpretations of the criteria. I’m about to recommend something shocking. Ready?... “You’re going to have to read your extended essay.” I’m sorry. I know it’s really long. Every year I read Extended Essay’s that are just horrible. They make almost no sense. They repeast themselves. They bring tears to my eyes and not in a good way my friend. As you read your Extended Essay take a pen to it and mark it up like you were me. -Find grammar and spelling mistakes. -Cross out superfluous writing. Could you say the same thing in fewer words? Yes. This is always true of your writing. And for mine. Start by deleting most of your introduction, for example. And then look for times when you say things you’ve already said before. -Look for times when you used sources (even when it’s not for a quotation) but you haven’t cited it. -You know what I’m saying here. Mark it like your teacher would mark it. Don’t think that this is your teacher’s job to do this for you. In this case it’s really not. We can’t give you line-by-line advice. Just general feedback. And even if you’re lucky enough to have a teacher who will give you a lot of feedback, you’re wasting their time and yours. It’s much better to hand in a well-written, edited piece of work so your teacher can focus on helping you with the smart (rather than the silly) mistakes you’ve made. 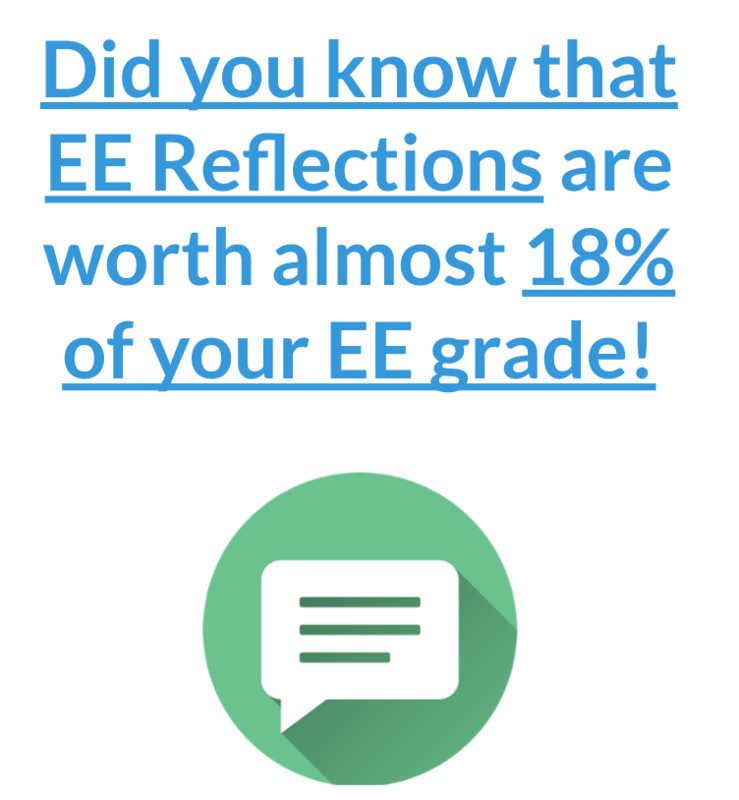 Exemplar Extended Essays (ones from previous years) are a great resource. You’d be crazy to not avail yourself of these. Look for anything they’ve done well that you could emulate. For example, have they structured their work in a clever way? Does their conclusion tie together the mini-conclusions they’ve made throughout the essay? And that’s it dude. You're done.